Here is the final few pages in my journal. October has to be my favourite page, I think it turned out so well! For this page I divided it into four sections, in the top and bottom sections I masked and stamped the Calendula and coloured it in using autumnal colours. In the two side sections I used the moon and bat from Octobers Project club set, the word "Halloween" from A Touch of ... Autumn Stamp set (stamp ref: 0701085a) and a spiders web I picked up from the shop a while ago. I randomly stamped these all over the sections, then distressed them in green and purple (to get that spooky feel!). To add to that spooky feel I clear stamped some of the spiders web and added Stardust embossing powder. To finish it off I added some green and purple ribbon to cover the edges of the sections. I then matted this onto orange and purple card. Along the edge I added staples again to add to the spooky feel. 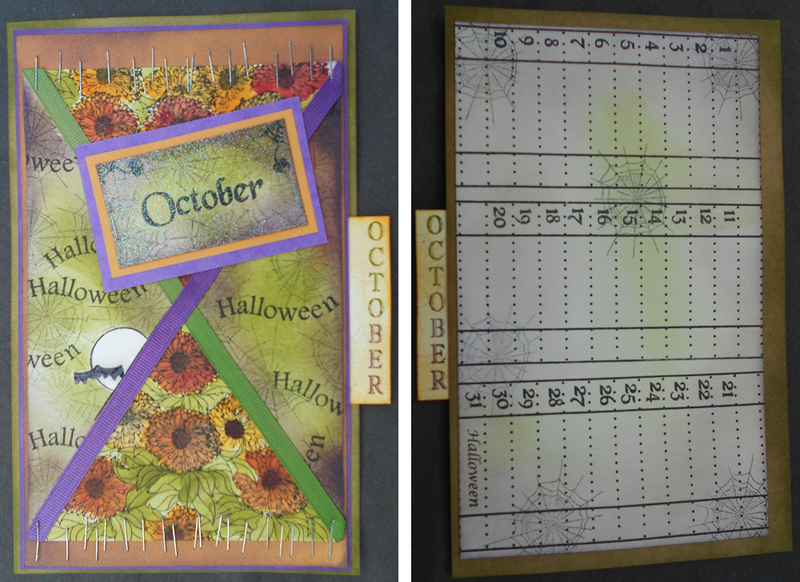 I then made the "October", to do this I stamped "October" then masked it, so I could stamp the spiders web randomly. 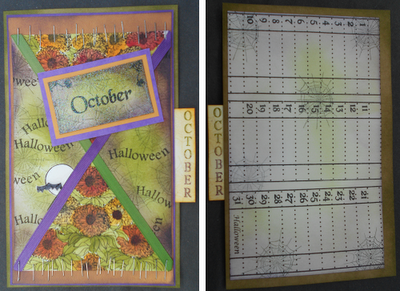 In the two top corners I added the small spider and web from Octobers project club. This was then distressed using green and purple. To finish it off I cover it all in Stardust embossing powder. For the calender part I randomly stamped the spiders web, then distressed lightly with green and purple! 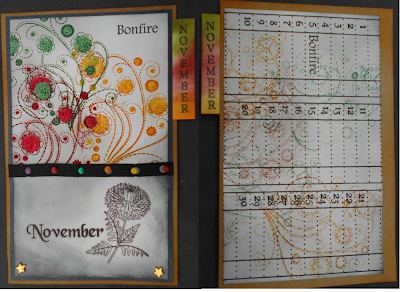 I wanted November to look like fireworks, so I used bright colours and a stamp called Time Flourishes Stamp (ref: 0605039A), I think it worked! For this page I split it into two, on the top section I stamped Time Flourishes in green, yellow and red. Then I stamped "Bonfire" from (A Touch of ... Autumn Stamp set (stamp ref: 0701085a)) in the top corner. I then lightly distressed this with black ink to get that smokey bonfire night feel. I then added Stickles. 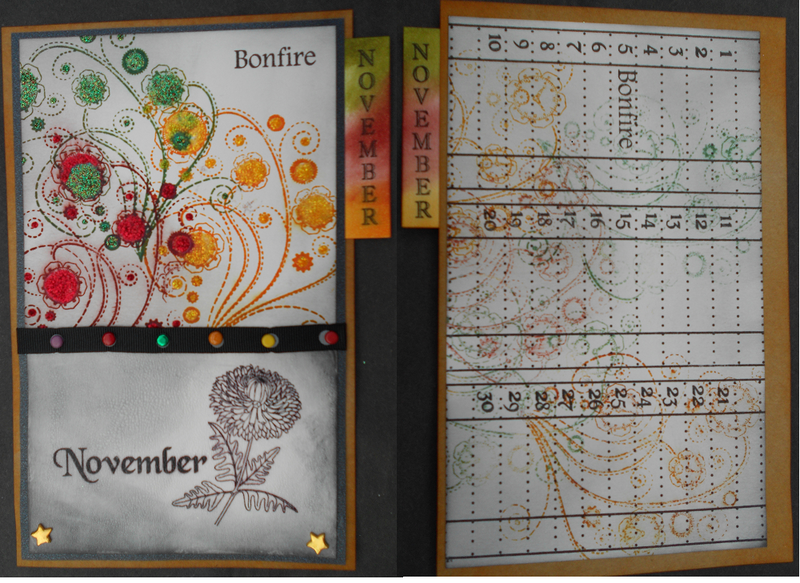 At the bottom I stamped "November" and the Chrysanthemum. I then masked the Chrysanthemum and distressed it. Where the two parts join I added some ribbon and brightly coloured brads, at the bottom I added some star brads. 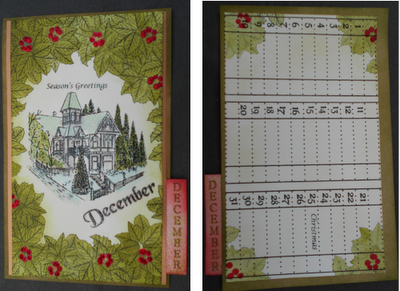 For the calendar part I randomly stamped Time Flourishes in bright colours then distressed lightly around the edges. 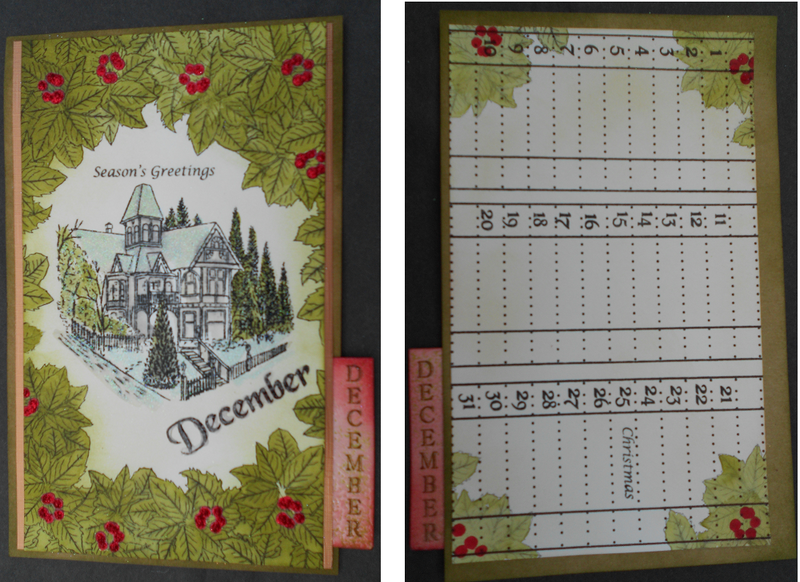 December was another quick page to do, all I did was create a frame using the Holly stamp. Inside the frame I stamped a beautiful Christmas scene from a stamp set called Wordflake Project (ref: 2300050A), the word "December" underneath the Christmas scene and "Season's Greetings" above it. I then coloured it in using distress inks. I added Stickles to the Holly berries and embossing powder to the snowy areas on the Christmas scene. For the calender part I stamped the Holly in each corner, and the word "Christmas" from the Grand Word Perfect stamp set (ref: 1803161a) on the 25th row. I really enjoyed making this journal and I was surprised how quickly it all came together. I have already had a hint that "it would make a lovely Christmas present!" What a great idea I get to have more fun making another!